THIS SCIENCE FICTION DYSTOPIAN HOUSING IS SO COOL | "Global Possibilities"
This author is not a science fiction enthusiast, so forgive my ignorance of Ernie Cline and his 2011 book “Ready Player One,” which apparently is a big deal in that world. The cover of the book shows a skyline of the not-so-far off dystopian future the book portrays. 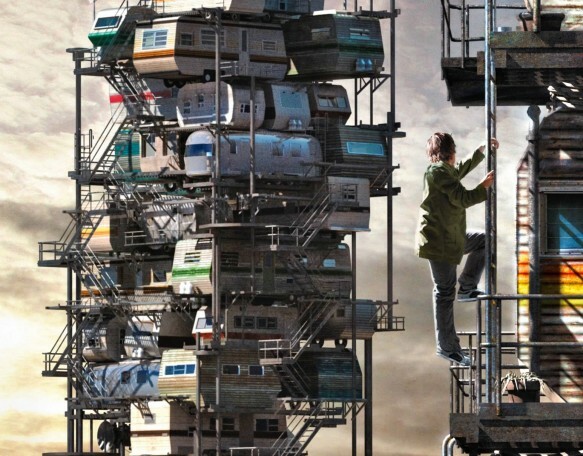 Dystopian as it’s supposed to be, the towers of stacked camper trailers look pretty awesome, like an uber low-tech version of Kasita prefab housing.